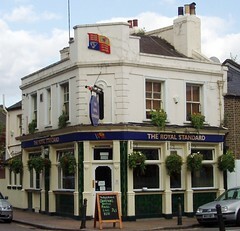 A pub in Wandsworth, near Wandsworth Town Station, and one of the few not owned by Young's. It was formerly a Tup pub (known as the Tonsley Tup) and is still owned by the same company (Innventive, formerly Massive), though now unbranded. Given the ever-crowded popularity of the Alma directly opposite the station, it can be a surprise to head only a minute's walk to the east and find this pub so much emptier. At 6pm on a Wednesday there were only a couple of regulars at the bar, though a few more tables were taken by the time Ewan left half an hour later. Although quieter than the Alma, there's still music played in the background (Sting on my visit, unfortunately), as well as a good selection of up-to-date magazines in a rack. TVs play sport at either end of the bar, though the sound was off. It's not a large space, but there's a beer garden out the back as well. There's one handpull for ale on the bar, which on a December 2008 visit had Landlord (£2.80/pint). San Miguel and some other basic lagers were also available. No food is offered, but a large sign advertises that takeaways can be eaten in the pub, who will even provide plates and cutlery. Accessibility: No steps to get in, but toilets are above the bar, up a long narrow staircase. Last visited by Ewan, 3 December 2008. Opening hours taken from the website, December 2008. Last edited 2015-09-12 14:09:39 (version 5; diff). List all versions. Page last edited 2015-09-12 14:09:39 (version 5).